Refraction is one of the novelties of our Spring-Summer 2015 Collection and is the first item we launch exclusively for women. This is a dark grey sweatshirt with boat neck and a modern cut, manufactured in ring-drilled brushed cotton and polyester. The image giving this item its name is silk-screened on its front: an abstract and geometrical representation of light refraction. As we have been doing with the rest of the products, Refraction has been designed by artists from Asturias and produced by Spanish artisans and manufacturers. We have launched item in a limited edition of 25 units. To get more information on this product, visit Refraction in our online shop. Short sleeves have always played a prominent role among our products; tees to be more precise. We have launched different t-shirts collections with silk-screened designs. But for this spring-summer season, we have opted for long sleeves. This collection by HETZL means the extension of our product line. Now, you may not only choose between the different designs of tees; now we also have sweatshirts, shirts and accessories. Once more, we have worked together with Spanish designers and manufacturers and have launched our items in limited editions, thus transferring to each of our items the value of being unique. Most of these products have been designed and manufactured to be unisex. Among these products, we may find: DNM '78, a slim fit denim shirt with the word HETZL embroidered on its chest; Catcher, a baseball sweater in white and grey; Uppercase, a typographic silk-screened sweatshirt playing with the visual perception; or Refraction, which is an exclusive graphic sweatshirt for women with its boat neck. Regarding accessories, we have designed DNM Trip, a travel bag manufactured in denim to carry everything you need for the gym or a weekend getaway. We add to this collection of long sleeves items and accessories our well-known t-shirts with their geometric and typographic design, from the recent Neon Dust or LESS IS HETZL, available in white and black for men and women, to the known Leopard or Diamond in clear colours for this summer. All our products are already available in our on-line shop for men and women. A preview of this collection could be seen in last December in the LABshop Market of LABoral. There we could experience the success of many of the new items: sweatshirts, T-shirts, shirts and denim bags. For this new women’s´ collection we have opted for long sleeves and limited editions of 30 units per design. 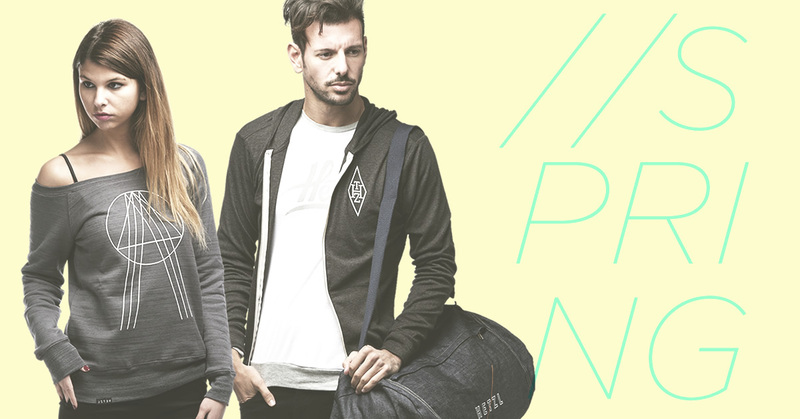 Five sweatsshirts in different styles and a denim shirt, accompanied by a denim travel bag and our graphic T-shirts. Refraction, a grey sweatshirt with boat neck, is the star within this collection. Its cut allows different ways to wear this sweater. It is silk printed on the front with an abstract and geometrical representation of light refraction. DNM '78 is an unisex denim shirt with slim cut. Manufactured in denim cotton, this dark blue shirt has the HETZL logo embroidered in white and orange. The buttons of the sleeves allow rolling up the sleeves and transforming the shirt in a short sleeves shirt whenever we want. DNM Trip. In combination with DNM '78, this denim bag is the perfect companion for weekend getaways or gym sessions. Manufactured in cotton with a zip, the bag is equipped with an outer pocket and an adjustable strap. Like it is the case of the denim shirt, the bag has the HETZL logo embroidered in white and orange thread. Uppercase is a typographic cotton sweater, with an uppercase “H” silk-screened on it, combined with red lines playing with the visual perception of depth. Fuss. This black hoodie is inspired in the kits of sport clubs. The HTZ letters are printed on its front like a coat of arms. With zip and hood, this sweater is inviting us to use it to complement a casual look. HTZ is a black typographic sweater. Manufactured in cotton, it has the HTZ letters silk-screened in a washed-out effect on its front. As we mentioned earlier, in this new women's section you may also find most of our graphic T-shirts – the ideal garment for this summer. During the last weekend, December, 13th – 14th, HETZL was present at a new edition of the LABshop flea market organized by LABoral Centro de Arte y Creación Industrial (Art and Industrial Creation Centre). The Gijón Art Centre is promoting since 2008, with the successive editions of this market, the sake of exclusive products designed by regional artists: design T-shirts, badges, pictures, post cards, decorative objects, jewelry… At the same time, this initiative brings art closer to children, with workshops organized during the market days. HETZL was present at the Christmas edition of the LABoral market, together with Fusion Street, and accompanied by other Spanish brands, like Dolfie, p o é m a p e or Modernaked. Dozens of designers from Asturias met close to our booth were, among other, the Aventuras Literarias editorial company, Okappi with its exclusive furniture manufactured with recycled materials or To the Wild with its famous teepees. The slogan of this year´s LABshop market, “handmade with love”, is a good description of our products. For this reason, HETZL presented part of its 2015 Collection, with a limited edition of design T-shirts and handmade graphic sweaters. During the two days of the market, we experienced the warm acceptance of our products by the visitors. We want to thank the people of Fusion Street for relying once again on us, as well as the organization of the LABshop market and the staff of LABoral Centro de Arte y Creación Industrial (Art and Industrial Creation Centre) for making this market possible. We want to also thank all the other artists, brands and stores, and all the visitors during this weekend. You can see pictures of the event in our social networks, Facebook and Pinterest. Last Sunday, October, 6th, we attended a new edition of the Rave Market at Sala Shoko, the in well-known La Latina District in Madrid – between the Rastro Flea Market and Lavapiés -. The session was celebrated from 12:00 a.m. to 21:00 p.m. This issue of the Rave Market in Shoko, a market already operating for two years and which enhances recycling and exchange of second hand goods, reserved a full floor to SamyRoad hosting HETZL. SamyRoad is an already well-known social network for trends, an online fashion platform in which not only fashion trends are present, but also travels, arts, music, audiovisual… Thus, it becomes a community to share content and also to purchase. HETZL presented its T-shirts collection in what was our first market During the nine hours of the Rave Market, we could perceive the great acceptance of our items by the attendants. We from HETZL want to thank SamyRoad for inviting us on this occasion, and the Rave Market organization to make our attendance possible. We also want to express our gratitude to the rest of the brands and shops, to the INdiyeis, who contributed the music, and to all visitors during this Sunday. You can see more images of the event in the social networks: Facebook y Pinterest.